Located just outside of Cincinnati, Covington makes for a great break outside of the big city. It’s full of gourmet eateries, fun attractions, and friendly people that are sure to make the trip worth it. Whether you’re flying to Covington for a bit of rest and recovery, or you want to check out Cincinnati without all of the huge city’s hustle and bustle, its a great destination for a luxury private flight, and Kentucky Jet Charter is the best company to help arrange your private flight to the area. Our Wyvern certified brokerage is available 24 hours a day ad 7 days a week to ensure that all of your needs are met exactly when they need to be. And with our wide range of clients, we’ll be able to accommodate just about any demand. So whether you’re a top tier business executive, A-list celebrity, or seasoned veteran, we’ve got you covered. We can arrange everything from multi-leg private flights with gourmet in-flight catering to luxury ground transportation and private helicopter lifts. Covington is full of lodging options for private jet flyers. From contemporary design hotels and boutique cottages to charming bed and breakfasts, there’s a lodging option for every occasion. If you’re just in town for a night or two, then the absolute “must-see” is Hotel Covington. With a full service bar that’s popular with the locals, generously appointed rooms, and carefully curated décor, this is one lodging option that shouldn’t be missed. And though it’s definitely one of your best options for a business trip, there are plenty of other options to choose from. Regardless of where you stay, the best way to get in and out of Northern Kentucky is via luxury private jet. Covington Jet Charter has compiled a list of the best hotel options in and around the city. Based on client feedback, online reviews, amenities offered, and location, there’s sure to be something on the list that piques your interest. 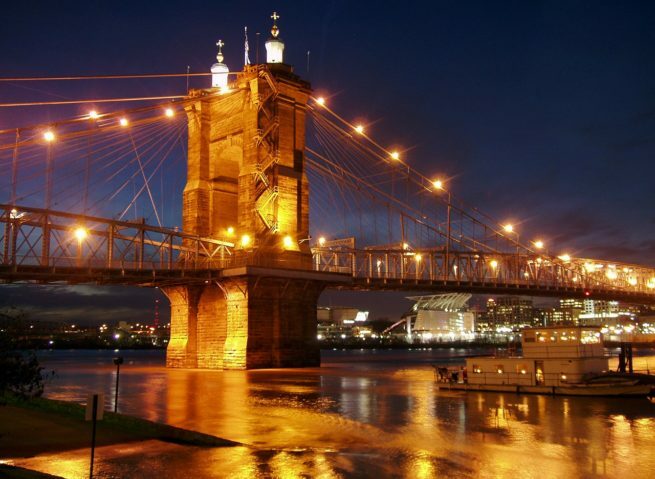 Read on to check it out, or give us a call to book your luxury private flight to Covington, Kentucky. Covington is a small town in the heart of Kentucky, and definitely isn’t known for having an amazing nightlife. However, there are still plenty of options for you if you want to have a night out on the town. And of course, Covington’s real charm lies in its mom and pop feel, its friendly locals, and its family atmosphere. It makes for a great family getaway, especially if you’re into outdoor activities like hiking, biking, and running. Devou Park is an iconic woodland retreat just outside of the city, and is popular with locals and visitors alike of picnics and barbecues. At 700 acres, it’s the perfect place to get a little lost and re-affirm your relationship with mother nature. Now if you prefer burning the midnight oil over lounging at a park, Covington still has you covered. Braxton Brewing Company is the city’s premier nighttime destination, and for good reason. With their plethora of interesting and tasty beers backed up by unimpeachable service, they show every guest a great time. Whether you’re heading to Covington for a business conference, a bit of rest and recovery, or to check out a prospective investment, you’re sure to have an enjoyable time. However, with so many fun and interesting things to do, it can be a bit tricky to choose the right things for your itinerary. To help with the decision, we’ve compiled a list of the most interesting and fun things to do in and around the area for private jet travelers. Our list of attractions is based on private air charter client feedback, online reviews, and location, so there’s sure to be something on the list that is up your alley; read on to check it out. Kentucky Jet Charter utilizes the following airports to fly clients privately to/from Covington, Kentucky and neighboring areas. Request a Quote or give us a call at 1-888-987-5387 to speak with one of our Covington Private Jet Charter agents for your next luxury vacation, business trip, or special event.